Hey – thanks for visiting! This week the Xyron Design Team is playing with Clearsnap and boy, are we having fun! Start with an inked and distressed tag in your favorite colors. Use a scallop circle punch to make several layers (7-12) of scallop circles to create the fluffy flower. 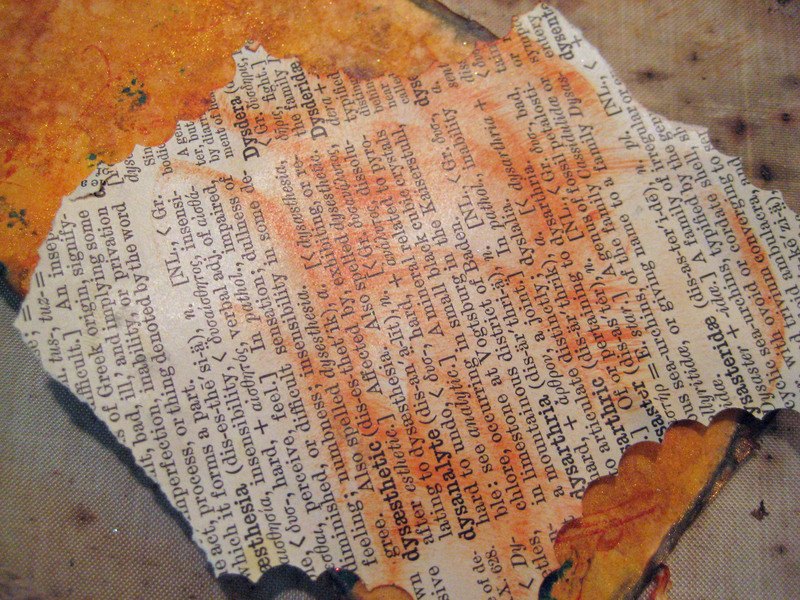 I like to use old dictionary or book pages. Ink the edges of each circle with Colorbox Fluid Chalk Ink. Stack and pierce a hole in the center and insert a brad. Gently crunch each circle up and around the brad, leaving the bottom scallop flat. 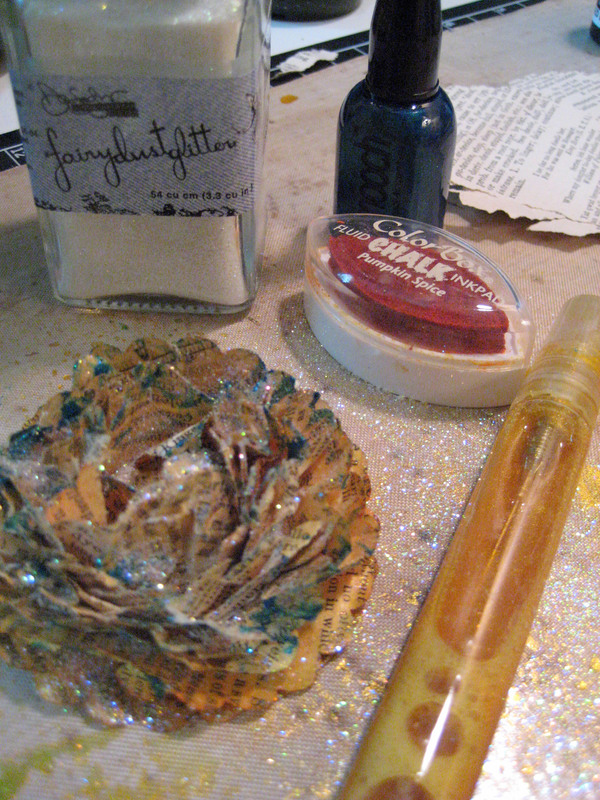 Gently open the flower layers and brush on some Smooch Accent Ink. Spritz with the Smooch Spritz then sprinkle on the Fairy Dust Glitter; heat set. Your flower will become a little stiff. Spritz the tag with the Smooch Spritz. 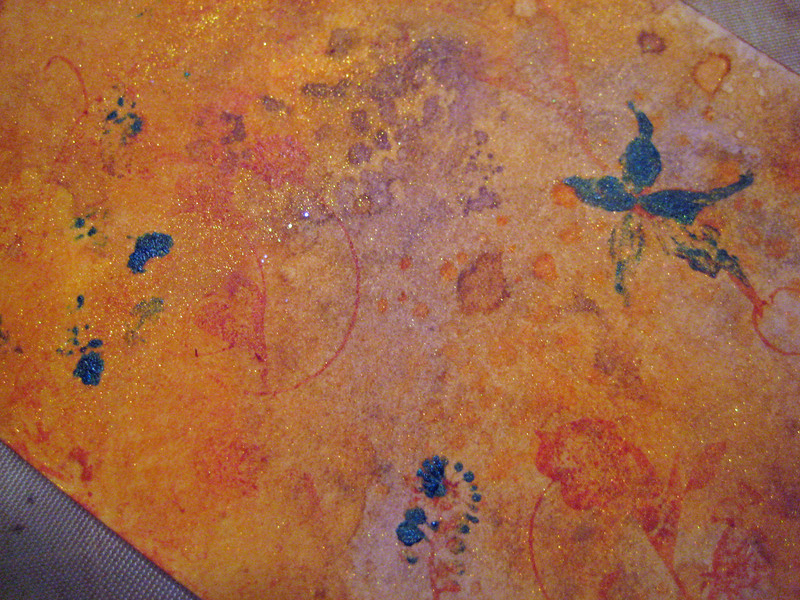 There is so much mica and color in these – very intense and pretty! Heat set. 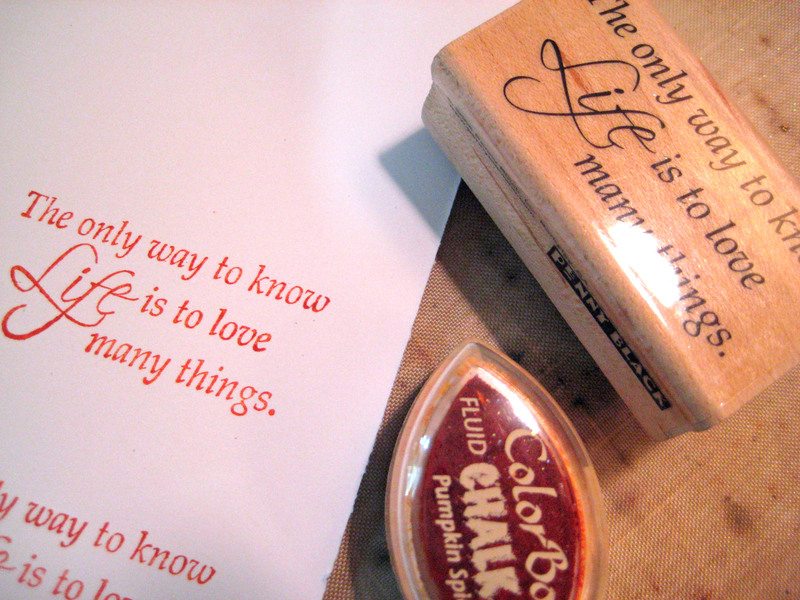 Add ColorBox Chalk Ink to a background stamp, then brush on the Smooch Pearlized Accent Ink to highlight some areas of the stamp. 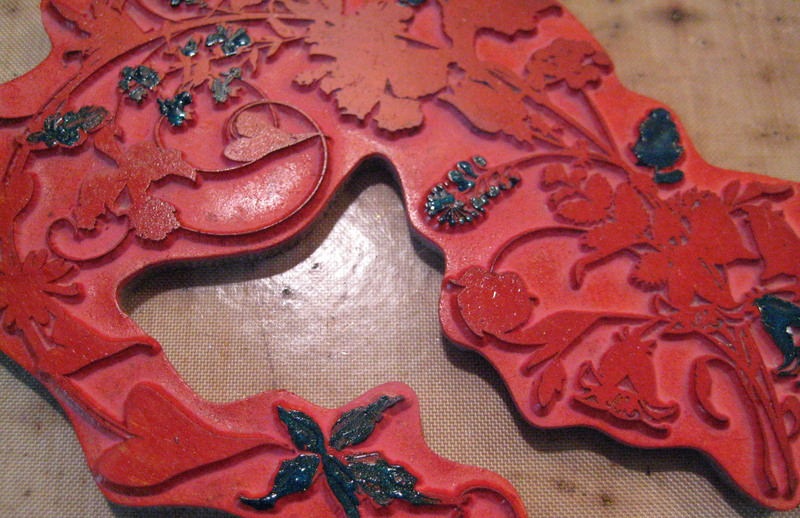 Stamp the colored and distressed tag to imprint a bit of texture. Distress the edges with an edge distresser and use an ink applicator to add some watered-down Wicked Black Dye Ink Refill (I squirt the refill onto the non-stick craft sheet and spritz with a little water). 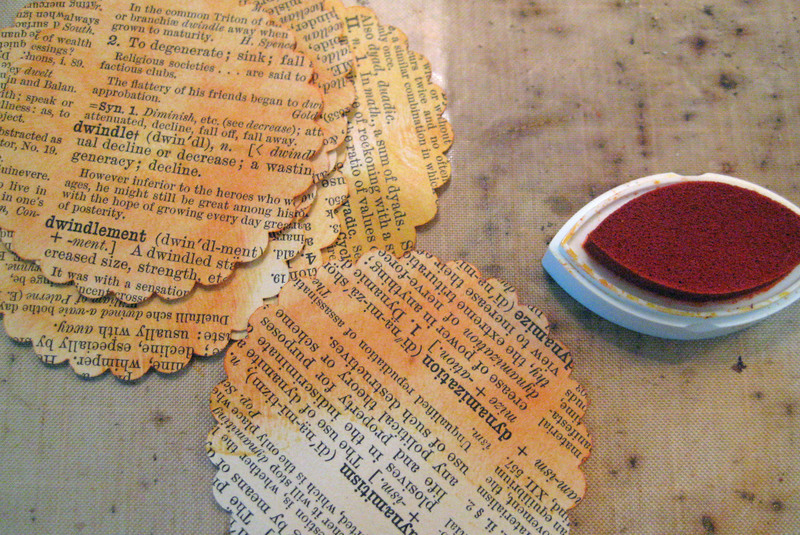 Ink a scrap of dictionary paper with the Chalk Ink and adhere it to the center of the tag by applying a few random swipes of Xyron’s Permanent Adhesive Glue Stick. 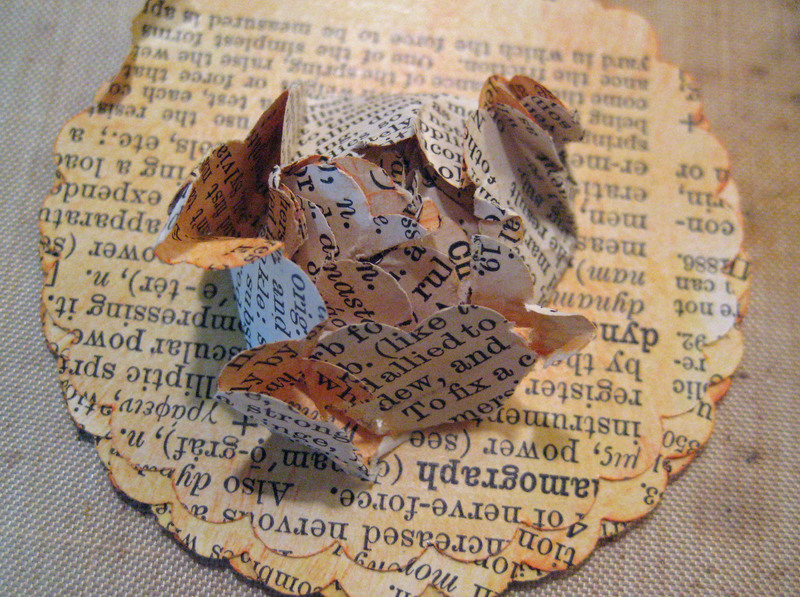 When dry, gently tear away the paper that is not glued down. 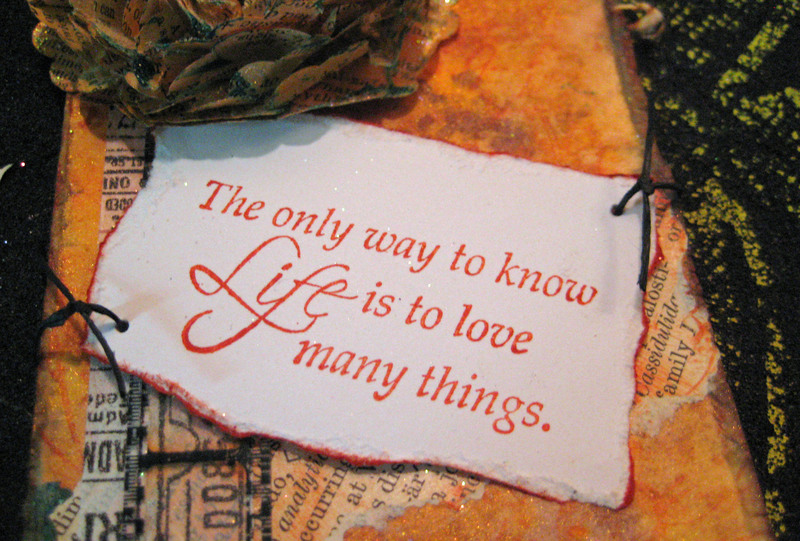 Stamp a sentiment on white cardstock with the Chalk Ink; heat set then tear edges and ink the edges with the Chalk Ink. 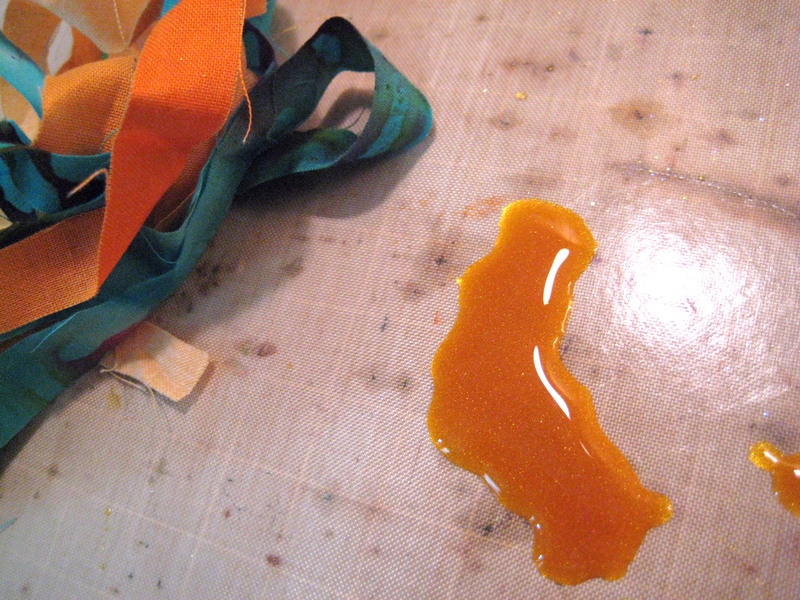 Add a strip of tissue tape and filmstrip ribbon to the left edge of the tag. 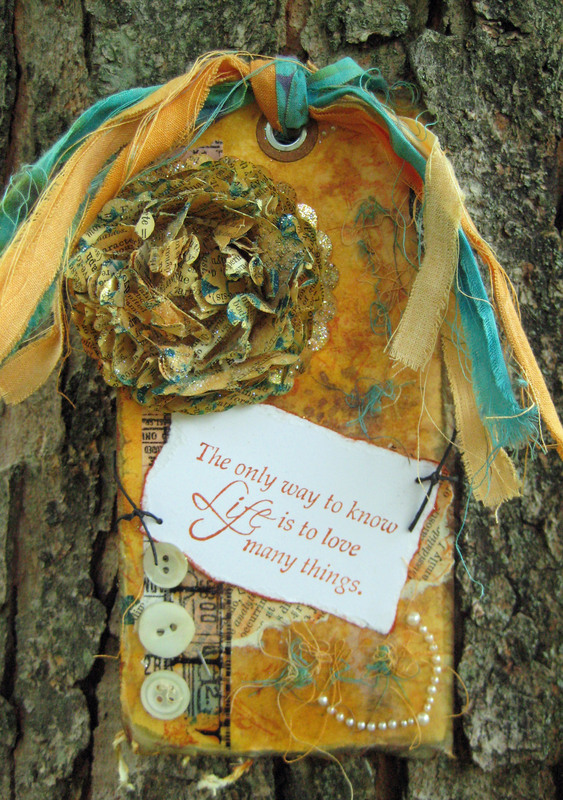 Adhere the sentiment in place with Xyron’s Glue Stick, pierce a hole in the sentiment and tag and add floss for a decorative element. Cut some fabric scraps and spritz with the Smooch Spritz; heat set (I like to pour some Smooch Spritz onto my non-stick craft sheet and swirl the fabrics around in it). 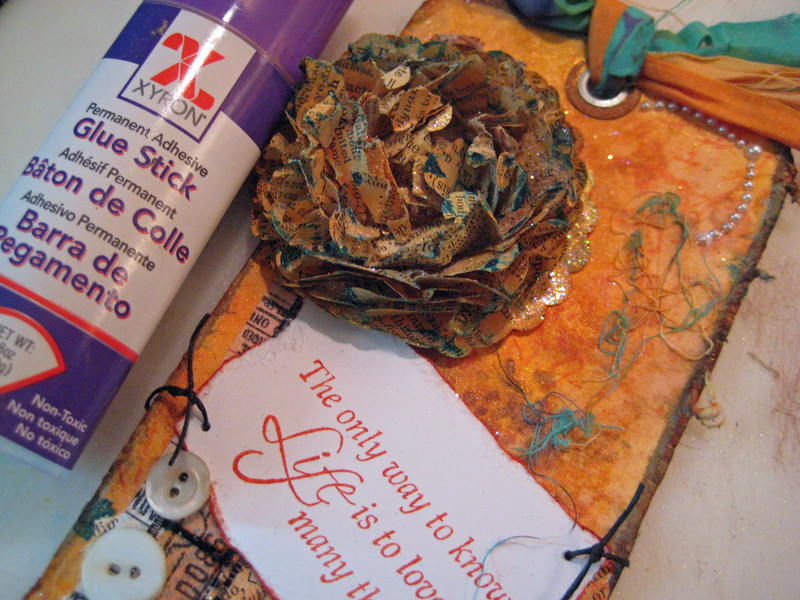 Add the fabric scraps to the tag and glue the flower on using Xyron’s Glue Stick. Pull some threads from the fabric scraps and glue them to the tag with Xyron’s Glue Stick to add even more depth and texture. 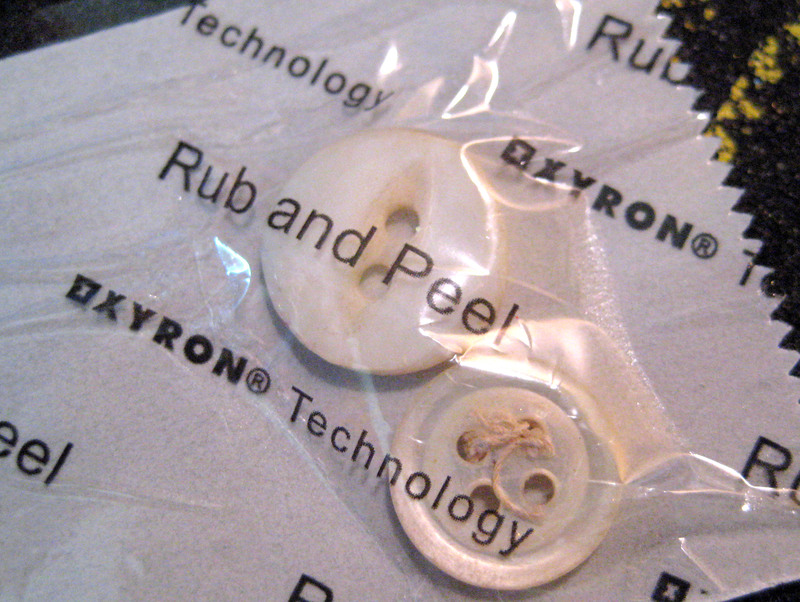 Run three buttons through Xyron’s 1.5″ Create-a-Sticker and add to left side of tag. Assemble; add a few gems from Want2Scrap here and there and enjoy! Be sure to subscribe to Xyron’s Blog so you don’t miss a minute of sticky goodness! Like always you out did yourself..loved your tag,I’m always learning something new, buttons through the Xyron, what a great idea. Congrats on you article in Sommerset Studio!!! Beautiful article! I love the color combination! Great job! Linda..the flower is beautiful…great tag!